An affordable alternative to expensive walk-in tubs! The Easy Step Bathroom Safety Package begins with the installation of a Easy Step walk through bathtub cut out into your existing bathtub. The 24” wide by 9” deep tub cut converts your existing tub into a shower making it safer to step through instead of over the side of the tub. It can be installed in less than a day, and often in the same week. Call 888-271-7690 to reach the office nearest you or Find a Location. 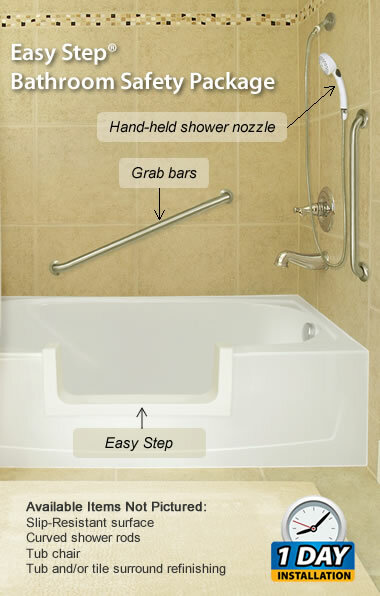 Designed to reduce the danger of slipping and falling when getting into and out of a bathtub, our bathroom safety package provides the necessary items to create a safe home bathroom environment for seniors and the mobility impaired. Installed by certified technicians. Giving you, or the person you care for, safer entry and exit from the bathtub. Reducing the risk of losing one’s balance when stepping over the side of a bathtub. Having ADA compliant grab bars installed for added support. Eliminating a slippery tub bottom. According to the National Council on Aging, one in three slip and fall accidents for adults 65+ happen in the bathroom, usually resulting in a serious injury. The Easy Step Bathroom Safety Package is an affordable solution for senior homeowners. It allows seniors and the mobility impaired to stay in their own homes longer. Walk-in tubs typically require large amounts of time and money to tear out the old bathtub, remove walls, and perform extensive plumbing modifications. The CleanCut Door Option gives you the same safety, convenience and independence benefits for thousands less than expensive walk-in tubs. Plus our one-day installation in your existing steel, cast iron or fiberglass tub, saves you the headaches of the time and mess the installation of a walk-in tub requires. An estimate for an Easy Step Package also does not require the high-pressure sales presentation most walk-in tub or door tub sales people demand. Miracle Method will provice a free estimate and respond quickly to schedule the installation. To learn more about how Miracle Method can make your bathroom safer, or safer for someone you care for, click on Find a Location or call our toll free locator number, 1-888-271-7690 to reach the nearest Miracle Method professional.